After helming the London 2012 Olympics Opening Ceremony, and directing the National Theatre’s adaptation of Frankenstein, Danny Boyle returns to the big screen with a taut and thrilling drama. Trance grips from its opening voice-over, in which James McAvoy’s Simon explains the necessary securities against heists in the high-stakes world of art auctioning, all the way to the film’s explosive final minutes. 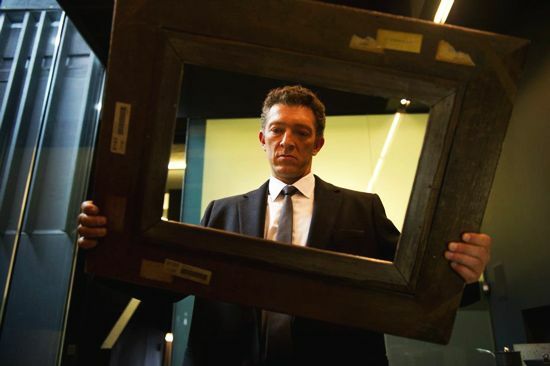 By this time, it’s clear Boyle’s latest isn’t about Simon’s failed attempt to pay off gambling debts to conman Frank (Vincent Cassel) by way of an inside job – it’s not really about art theft at all, but something much closer to home for all of us. As Simon talks us through the training which has prepared him for attempted robbery, we watch Frank illicitly sneak through a door. A series of simply, even casually, shot events occur to enable the crime. The use of a tiny bright pink electric car as a trapping device is a comic touch, one of few lighter moments in the film. The crime plays out, just about according to plan. Frank leaves Delancey’s auction house via a handy (but less than sanitary) chute, and struts off smugly, believing he’s carrying a Goya painting worth millions. If only it were that easy. After sustaining a head injury, Simon can’t remember where he’s stashed the painting. 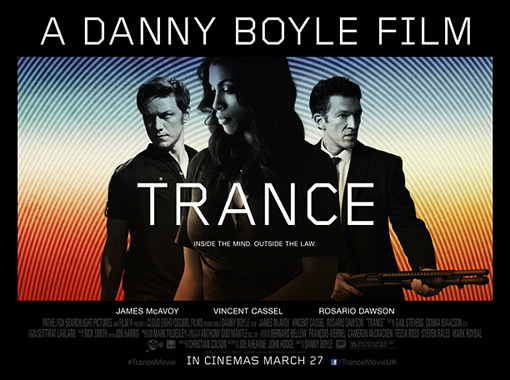 The subsequent entrance of hypnotherapist Elizabeth (Rosario Dawson) ushers in the absorbing character-driven psychodrama which makes up the complexities of Trance’s script, impeccably penned by long-time Boyle collaborator John Hodges (Trainspotting, The Beach) and Joe Ahearne, director and writer of the TV movie upon which Boyle’s Trance is based. Frank and his henchmen intend for hypnotism to reveal the painting’s location, lost within Simon’s mind. But first many other skeletons must come out of the closet. What follows is a fascinating look at manipulation, deceit, and the fragilities of the human mind; especially its converse capacities for obsession and forgetting. Simon’s earlier conviction, ‘no piece of art is worth a human life’, is called into question as the plot thickens, and the implications of messing with the mind, and with a person’s life, climb ever higher. It’s difficult to pin down a villain amongst the leads; all act immorally at some stage, but all are capable of drawing sympathy. This realism isn’t matched, however, in the supporting characters of Frank’s cronies, who are poorly-developed, resembling thuggish cardboard cut-outs. But it hardly matters, as the ever-changing relationships between Simon, Frank and Elizabeth provide more than enough to intrigue; including unprofessionalism, recklessness and exploitation. Every layer of truth revealed is more devious than the last, deferring rather than providing definitive answers. When the answers finally do come, however, the explanations are too quick, unbalancing the film’s pace. Like Boyle’s previous film, 2010’s 127 Hours, Trance is visually distinctive. Many scenes are awash with either orange or blue light, casting a translucent screen over events, suggestive of characters’ struggles to penetrate mysteries and deceptions. Aerial views of London’s complex flyover road systems light up the dark, standing for the connected pathways of the mind, or for the fragments of information each character must assemble in a search for the truth. As with any great twist, once you’re in on Trance’s secrets these fragments become clues which can be retrospectively pieced together; an errant tear here, a shocked look there. This attention to detail is sure to make repeat viewings just as satisfying as the first. And for some, Trance’s frustrating habits of misdirection, and apparent misdirection, may also be clarified by a second watch. But most baffling of all is Boyle’s consistent ability to top his own cinematic achievements with each release. This entry was posted in Film Reviews and tagged 127 Hours, Danny Boyle, James McAvoy, Joe Ahearne, John Hodges, Olympics Opening Ceremony, Rosario Dawson, The Beach, Trainspotting, Trance, Vincent Cassel. Bookmark the permalink.